IF DINOS CONSTANTINIDES’S life was made into a film, it would open with cctv footage dated July 14, 2014, 3.53am. This was the moment a still bar in the dead of the Nicosia night exploded into an inferno. The flames would fade out and, their significance unexplained, the timeline would jump back 10 years, to a 22-year-old student working shifts in a Cyprus bar. In 2004, Constantinides was studying e-business at Westminster university in London but bartended on his holidays back home in Cyprus. Constantinides had had no bar experience but, ever one for self-improvement, enlisted with the likes of shaker company in London to learn the classics, moving on to advanced training. He might not have known it then, but this marriage of bartending and business would form the foundation of his career. Once graduated, Constantinides faced a fork in the road. To either “work behind a desk in Cyprus” or follow his passion. He chose the latter and, upon returning to Nicosia, armed with his new skills, became known as ‘the cocktail guy’. He worked from bar to bar, creating menus and by 2008 started his own mobile cocktail service business. Constantinides was offering high-end drinks in the country of Ayia Napa, during a recession. To say the market wasn’t ready is putting it mildly. Business was slow, but at one party he impressed his host, Theo Middleton, who saw something in Constantinides and pledged to invest. 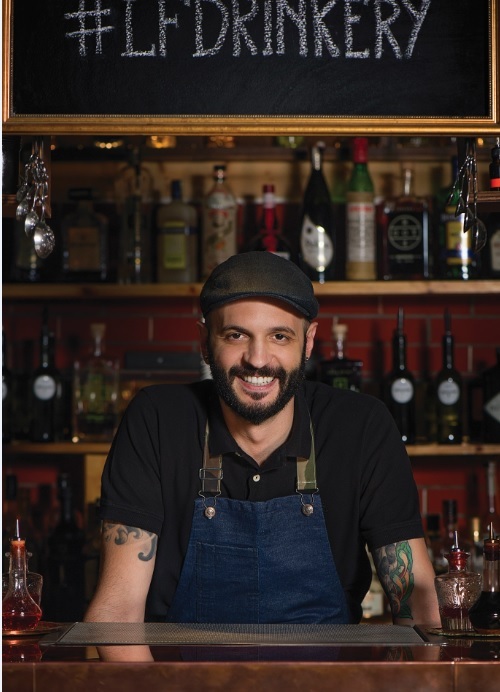 Middleton, partner Yiannis Gavrielides and Constantinides decided to open a bar school, found a premises, refurbished it with help from family and friends and by 2012 opened for business. “The next day after opening the school, two major Cyprus banks went bankrupt – we didn’t know what would happen,” says Constantinides. Indeed, Cyprus was in a state of economic emergency. Suddenly a cocktail school in a country that doesn’t have a cocktail culture didn’t seem so lucrative. “we knew we had to find a new revenue stream or leave Cyprus,” says Constantinides. The big idea was to turn the school into a bar, his school team into his bar team. It took eight months from inception to opening. The bar school was converted – furnished with the kind of things you might find in a Lost & Found office, but with splashes of luxury, such as the copper bar top. It was an ambitious project but Constantinides had a clear vision. There had to be attention to detail in all areas – quality of ice, glassware, cocktail-making techniques, spirits selection, service consistency and hospitality. In october 2013 the bar opened and sold 41,000 cocktails in its first year. Heads turned in Cyprus. “I got the phone call from the police at 5am,” says Constantinides, recalling the moment he found out his bar had been burned down. The cctv revealed an arson attack, one of a spate in nicosia at the time. The rumours were that it was the work of underworld figures but no one was found to be responsible. His business in ashes, Constantinides had only bought insurance on a hunch a month before. But still, he was only covered for 70% of the value of the contents, and not for loss of business while he rebuilt. Despite the smoke-damaged ruin, with the help of friends, family, business partners and even customers, it took just one month to reopen. The rest is history – the good sort. In 2015 lost + found was the first bar from Cyprus to be voted by the drinks industry as one of the world’s 50 best bars. A year later it repeated the feat.